Whether it was Streets of Rage, Golden Axe, Double Dragon, or Turtles in Time, most of us have spent a considerable part of our gaming lives defeating enemies and scrolling to the right. Not content with the beat-em-up genre standards, Treasure sought to mix things up a bit with Guardian Heroes. Originally released for the Sega Saturn in 1996, it quickly became a classic title, and now demands upwards of $80 on eBay. 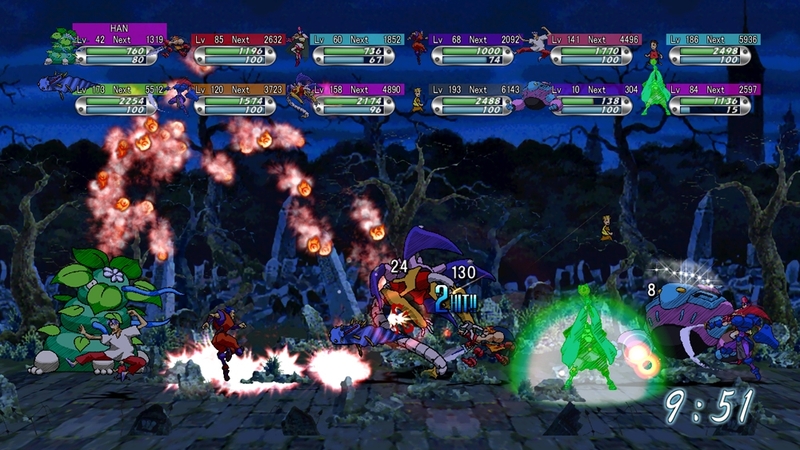 While Guardian Heroes may initially look like other games in the genre, it immediately sets itself apart in the gameplay. Rather than a open field that the characters can traverse, it is broken into three lanes. What at first seems like a limitation instead allows the combat to gain a fair amount of depth, with directional inputs added to button presses to create different attacks. If you think along the lines of a fighting game attaching different attacks and specials to these inputs, you’re on the right track. This also gives a better indication than many games in the genre of where exactly your character, and your enemies, are. Most attacks only hit the plane they are taking place on, so shifting to another plane allows the player to line up attacks easier. In many beat-em-ups, it can be difficult to line up hits exactly, or to tell if you are safe from an enemy attack until it is too late, and the three lanes helps alleviate that frustration. The player also gains experience with each strike, creating a further distinction from the genre. 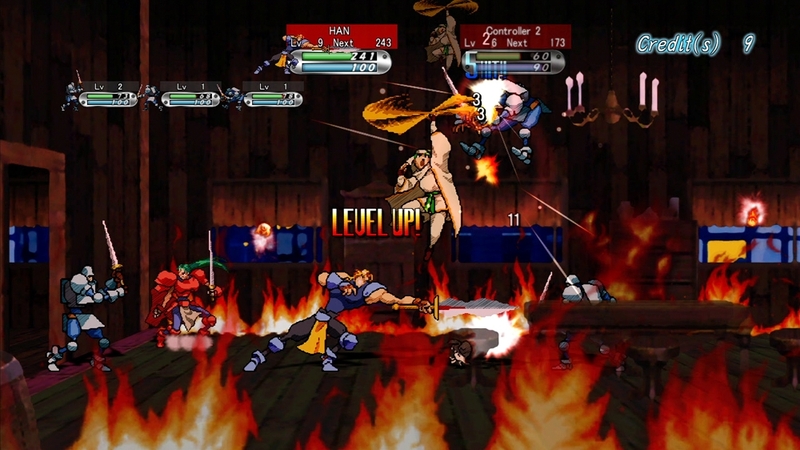 Every time a character levels up, the player is given a point to spend on stats between levels. While the choices of pumping Han’s strength up to make him do more damage, or Nicole’s intelligence to increase the damage, healing, and range of her spells seem obvious, other options are available. Perhaps you want to increase Nicole’s speed, allowing her to attack faster and regain mana quicker for more frequent heals, or you want to buff Randy’s strength because, even though he is a mage, you find his staff attacks are just as exciting as his magic. The stats are somewhat self-explanatory – strength increases damage, agility makes you attack faster, and so on. The game does not do the greatest job defining these stats, and learning what “MEN” and “LUC” do for your character are left to searching online. Another unique piece to Guardian Heroes is the Undead Hero. This companion character is picked up in the first mission and is placed under the player’s command. He has five settings, which include “attack,” “follow,” “protect,” “stay,” and what my friend and I who spent many days of in-game playing time liked to call “go nuts,” sending him into a sword-swinging, fireball exploding frenzy. This companion never gets in the way, and is as helpful as the player wants him to be, which ensures that the game is fun whether playing alone or with a friend. The story is introduced as the heroes celebrate finding a magical sword with a round of drinks. A knight named Serena bashes through the door to the inn warning the adventurers that guards are coming to arrest them, launching the player straight into the action. Each mission has more dialog than most beat-em-ups have their entire game. This serves both to advance the story and to create a break in the action – neither one wears out its welcome, with the exception of one scene with the main villain Kanon that is extremely long. Thankfully scenes can be fast-forwarded at any time since players will see this scene every playthrough regardless of which path is chosen. “Path chosen,” you ask? Yes, Guardian Heroes has a branching story as well. During missions, the player will be given options of different dialog, and the choice picked determines which stage is next. While there are thirty missions in total, the average playthrough will only see seven-to-twelve of those missions. These lead to seven different endings, each one taking anywhere from one to two hours to reach, leaving the player with a lot of replay value. If that wasn’t enough, Guardian Heroes includes a multiplayer arena mode, as well. This allows six players to fight against each other using the main characters, or around forty other supporting characters from the game. These unlockable characters included enemy soldiers, bosses, and even Randy’s rabbit pet Nando. The presentation of Guardian Heroes on the Saturn has always been a bit mixed. The music is a fun mix of the sort of synth and electric guitar one would expect from 90s fantasy anime titles, and it is still charming today. Graphically the game is quite pretty, with colorful backgrounds and some pretty unique character designs. It falls apart a bit, however, thanks to some horrible slowdown that occurs especially when a large number of enemies are on screen. This also happens with some larger spells so, while a fully intelligence buffed Randy was powerful, his beam attack would slow the game to a crawl. And this is where the XBLA release shines. Guardian Heroes on the Xbox 360 has the sort of polish one would expect in a remastered classic. 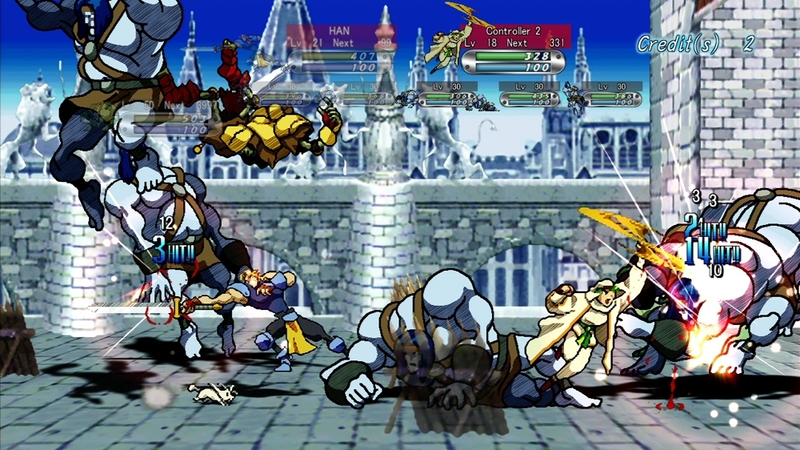 The characters have been redrawn, taking on a look that can only be described as “if cel-shading were done with pencils.” This change from 2D sprites allows the game to look beautiful in a 16:9 aspect ratio. 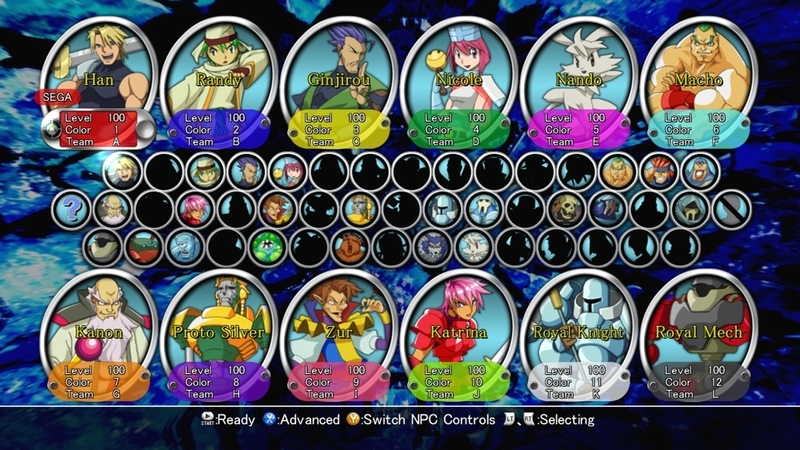 Players can choose the original or new remixed graphics from the main menu and, thanks to the Xbox 360 hardware, the game does not suffer any of the slowdown prevalent on the Saturn in either mode. There is also an added “arcade mode” for this XBLA release, where the player fights wave after wave of enemies. Think Gears of War‘s horde mode and you’re on the right track. The longer you last, the higher your score, and the higher you place on the Xbox leaderboard. It is a fun diversion, but not the main draw of the game. Another new feature that does change the core gameplay is “remix mode.” The number of attack buttons have been increased from three to four, and a backdash has been added to allow greater mobility for both the player and enemy characters. All characters have also been given a move called a “forceback,” creating a burst of energy that pushes enemies away. This helps avoid not-fun situations where the player can’t move because he is being attacked from all sides. Casters Randy and Nicole have been given more flexibility with their spell use thanks to a reworked magic system. And, if players dislike the changes, they can simply revert back to the original mode at the main menu. 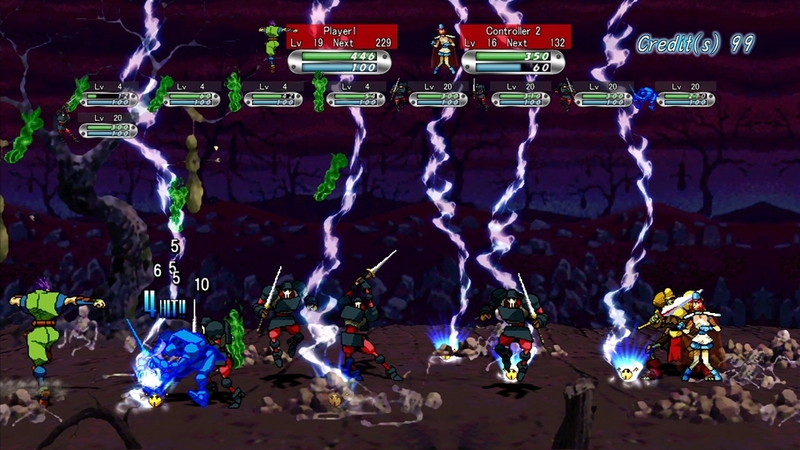 As is normal for a current console release, Guardian Heroes on XBLA includes online multiplayer. The campaign can be played with another player online, while the versus mode has been expanded to allow up to twelve players to fight in what has to be the most chaotic battle this side of Super Smash Bros. I had minimal lag while playing online, and what community is left is quite cordial, even if they made my skills feel inadequate at best. If it sounds like I am gushing through most of this piece, there is very good reason. 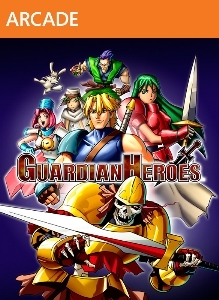 Guardian Heroes is a classic, and is considered one of the best Saturn games ever released. I bought the original in 1996, and still boot my Saturn from time to time for a play through. The XBLA release takes the game and molds it into something even better, removing the slowdown, tweaking the combat in meaningful ways, and adding online functionality to the already fun multiplayer, all while being far less expensive than the original ever was. This is a game that deserves to be in everyone’s collection, and I highly recommend Guardian Heroes to anyone with an Xbox 360. Next Post:Namco Bandai Ready For More Ace Combat?